Thank goodness for the clever things in our kitchens that spare us from disasters and reduce the amount of mess we make. The technological sophistication and capabilities of contemporary appliances means that they can do much of the thinking (and the work) for us and, when you buy a quality product, you will effectively have a ‘helper in the kitchen’ for many years to come. So, what are the essential appliances for your kitchen? If ever there was an appliance that can make all the difference to your efforts and achievements in the kitchen, it is the oven. It makes a great deal of sense to choose a quality and well-designed oven, such as the ovens made by specialist retailers like ASKO . Find out more by visiting this website . When choosing an oven, commit to careful research. Care should be taken to choose an oven that will best meet your needs, allow you to advance your skills, cook your food to perfection and stand the test of time. Always choose an oven of the highest quality – it will make all the difference to your kitchen experiences and foster a real enjoyment of cooking and baking. You may think that as long as your refrigerator keeps your food cold, it is doing a great job. Think again. Today, refrigerators designed using the most sophisticated technology have an amazing range of features available – from apps related to the weather, recipe selection, and useful memos for things such as your shopping lists to an app that allows photographs to be uploaded. All of these features are, of course, in addition to refrigeration and freezer functions, and the provision of ice and cold water. Features such as the recipe search are infinitely useful. This feature makes it possible for you to enter in the ingredients that are in your fridge and receive a selection of recipes that incorporate these ingredients. Not only does this help you to come up with, create and deliver delicious meals, it also cuts down the amount of household waste. 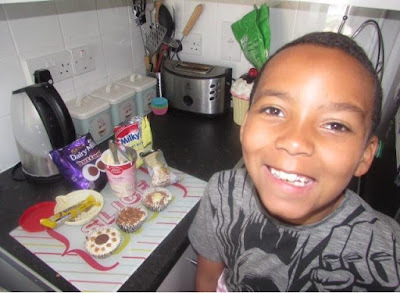 Spud loves to help out in the kitchen, his favourite is decorating cakes! No kitchen is complete without appliances that can chop, mince, knead, blend…and so much more. The most exciting news is that particular appliances that do all of these things in just the one machine are now available. With just one machine, your food preparation and baking worries are taken care of and your kitchen will not be cluttered up by numerous appliances that really only perform one function each. Imagine it – an appliance that allows you to enjoy your favourite ‘fried’ foods, with drastically reduced amounts of fat! It exists! Airfryer appliances allow you to experience the taste of deep-fried foods in a much healthier way and includes accessories that help with homemade pizza preparation and even brownie-making. Make your job in the kitchen so much easier with the inclusion of these appliances. The amount of time and effort that they can contribute in your kitchen is hugely valuable and, best of all, they will help you to feel like a culinary genius in your own home.